When the much-anticipated Momofuku opened its doors in Toronto a few months back, it was missing one key piece (in my sugar-addled, dessert-craving mind at least): the Milk Bar, where they serve up cookies, pastries, and perhaps most famously, Crack Pie. That omission has finally been rectified, with all kinds of treats available in a walk-in closet-sized space on Momofuku’s second floor (all baked, oddly enough, in New York and shipped here on a daily basis). What’s Crack Pie? it’s basically a sugar pie, or a butter tart without the raisins, or a pecan pie without the pecans. It’s nothing you haven’t had many times before, which makes its moniker a bit of an over-sell; it’s good, but I’m not going to be rushing out to have another one. It’s not quite as addictive as its name implies (and whether a small slice is worth six dollars is up for debate). I will be back, however, to try some of their cookies, which are much more reasonably priced at two bucks each. 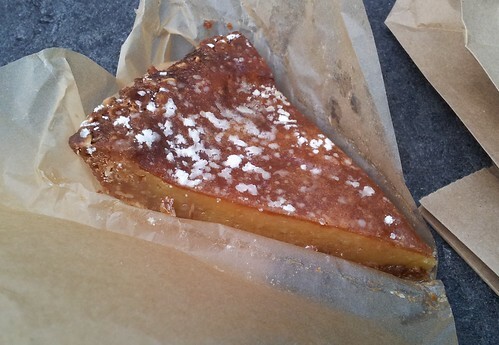 My favourite thing about the Crack Pie is probably the crust. Though the filling is quite tasty, if a bit overly sweet, the crust is pretty great. 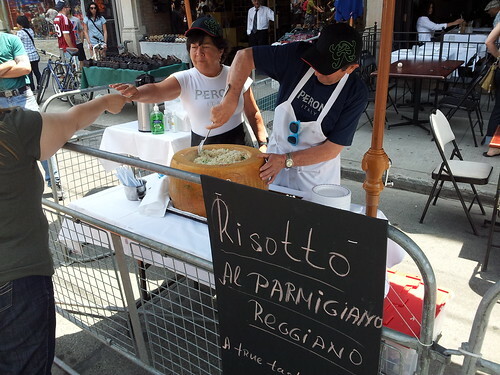 It’s dense and buttery, with a thin, crispy layer of caramelized sugar on the outside. It’s probably the closest thing to crack-like addictiveness in this pie. I remember the early days of Caplansky’s; before he opened his own place, it was just Zane Caplansky himself at the back of the Monarch, a sketchy old bar in Little Italy. Back then the smoked meat was truly something special: smoky, uniquely spiced, and unctuously tender. It could have easily gone toe-to-toe with the best smoked meat I’ve ever had, and I couldn’t get enough of it. But then, Caplansky moved to his own place, and things started to very quickly go downhill. The quality of the meat was wildly inconsistent, and they started taking shortcuts — such as curing the meat via chemical injection rather than naturally — that would have been anathema back at the Monarch. The sandwiches were, at their worst, so dry they sucked all the moisture out of your mouth. The fat was rubbery and unrendered. I got one sandwich with zebra-patterned swathes of uncured gray meat. I stopped going regularly. Things seem to have evened out recently. The last couple of times I’ve gone, the sandwiches have been much more consistent — but consistently middling. They’re fine. They are perfectly edible sandwiches. They’re better than Druxy’s, but worse than pretty much every other place in the city making good smoked meat sandwiches. The days of smoked meat that was so incredibly amazing it made my knees buckle are long gone, sadly. Oh boy. I’m going to stick with the sandwiches. Though the meatloaf tasted sort of okay, it had a repulsively mushy, baby-food-like texture that was truly horrifying. It tasted like they took a meatloaf, cooked it, crammed the whole thing into a blender with some liquid, then formed that mush into slices and served it. As for the smoked meat, it may as well not have even been there. There were tiny little bacon-bit-sized flecks of smoked meat interspersed throughout, but if I hadn’t seen them, I wouldn’t have even known they were there. You couldn’t taste them. The slices are glazed with a classic ketchup-based sauce, which was basically okay, if a bit cloyingly sweet and one-dimensional. 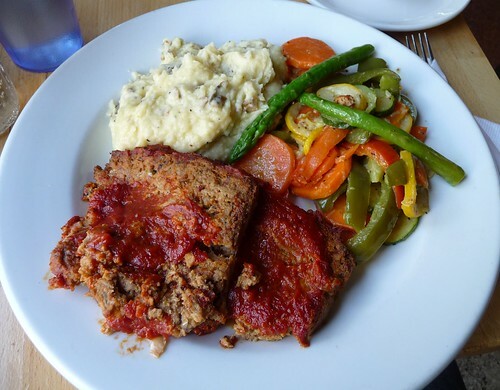 The meatloaf is served with some sauteed vegetables, which were fine, and your choice for the second side. I went with mashed potatoes, which were actually the highlight. They were creamy and slightly chunky, with a mild garlicky flavour. Thinking about the food on the way home, I came to the somewhat shocking realization that the meatloaf here was probably the worst I’ve ever had. Cafeteria meatloaf is better. Heck, even the frozen stuff you get at the supermarket is better. The version at Caplansky’s was shockingly bad. I’d feel embarrassed serving food of this caliber to guests in my home, let alone to paying customers in a restaurant. As a kid, one of my favourite things about going to Canada’s Wonderland was the ice cream; I’d either get a chocolate-dipped ice cream cone from the place right near the entrance (which, sadly, eventually turned into a Dairy Queen), or if I was feeling particularly hungry, I’d get a funnel cake. 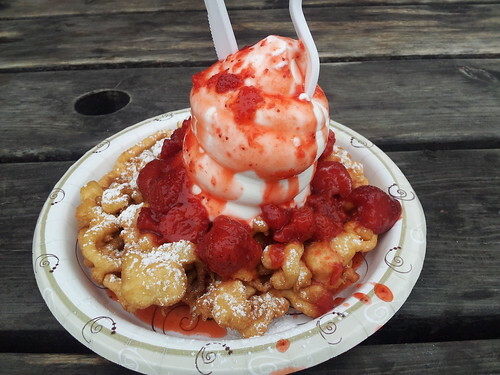 Ah, funnel cakes. What’s not to like? You’ve got the plate-sized piece of delicious criss-crossed fried dough, the icing sugar, the very sweet strawberry-chunk-infused strawberry sauce, and finally, a heaping mound of soft serve ice cream. No, it’s not fine dining, but if it doesn’t put a smile on your face, then I don’t even know what to say to you. You’re dead to me. I almost never find myself at Canada’s Wonderland these days, so my funnel cake cravings have gone unfulfilled. Imagine my delight when I found out that Dairy Cream in Mississauga serves a Wonderland-esque funnel cake, and that their version is just as it should be. The warm, freshly-fried dough, the strawberry sauce, the above average creamy soft serve: it’s all here. It’s nothing mind-blowing, but if you’re looking for a mind-blowing funnel cake, you’ll probably be searching for a while. I’ve never had anything from Fidel Gastro, the food truck that spawned Lisa Marie, but after their outstanding offering at this year’s Burger Day (they served that event’s best burger, in my opinion), I knew that I’d have to check them out sooner or later. 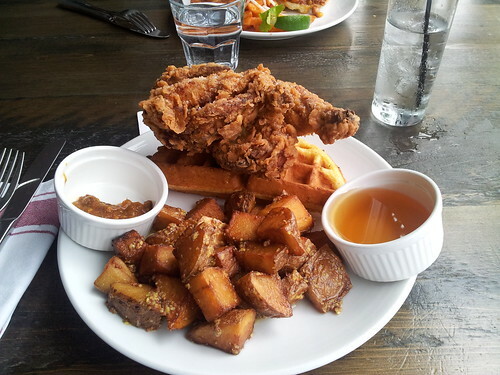 I went for brunch, and while there were a few items that caught my eye, the one I settled on was the fried Cornish hen and cornbread waffles. I have, sadly, been under the impression up to this point that I didn’t particularly like Cornish hen; the only other time I’ve had it, it was dry, not particularly meaty and, generally speaking, more trouble than it was worth. Clearly, my first Cornish hen experience was just a sub-par preparation of what can be a tasty dish, as Lisa Marie’s version was the complete opposite: meaty and abundantly juicy, with a really satisfying flavour. I don’t think gamy is the right word to describe it, because it wasn’t that; it was very chickeny. Yep, chickeny. That’s the kind of quality food writing that you can only find right here. It also had an amazingly crunchy, perfectly seasoned batter that was fairly close to fried chicken perfection. The cornbread waffles are, I’m pretty sure, just cornbread that’s been cooked in a waffle iron. Whether or not that’s a good thing is up to you; I’m a cornbread fan, so I quite enjoyed it, particularly when drizzled with the provided cup of maple syrup. I’d say it’s the best version of chicken and waffles I’ve ever had, but that wouldn’t be true; that honour goes to the chicken and waffles at Thomas Keller’s Bouchon in Las Vegas. But second best is nothing to scoff at. I got it with the duck fat home fries on the side. They were tossed with some kind of grainy mustard, and came with a spicy sauce on the side. They were a bit less crispy than I would like, and definitely weren’t on the level of that amazing fried hen, but they were still pretty good.